New arrival! This designer & fancy golden colored traditional necklace set for women from the house of Anuradha Art Jewellery. It is crafted from and golden polished copper. Excellent quality & high durability are the hallmarks of this necklace set. 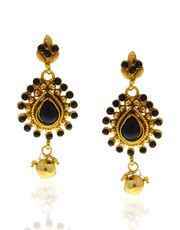 It is styled with navy-blue colored polki stones.